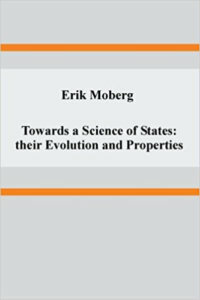 Towards a Science of States: Their Evolution and Properties. Erik Moberg. Moberg Publications, 2014. The discipline of political science is in crisis. Since the end of the Second World War, empiricists and political philosophers have battled for the soul of the discipline. The former group has clearly won most of the battles through force of arms, though political philosophy defiantly remains in most departments. The major disagreement between empiricists and political philosophers revolves around the very definition of science. For empiricists, political science is social science. Politics needs to be examined through dependent and independent variables. Empiricists assume that political phenomenon can be mathematized or quantified. Not only does the use of the scientific method provide precise (and perhaps even predictive) data, but it also serves as a bulwark against unquestioned assumptions and biases. Empiricism prides itself on its ability to distinguish fact from value. Political philosophers, on the other hand, assert that politics cannot be adequately quantified. They believe that political actors are endowed with reason, agency, spontaneity, and free will. Political actors cannot be studied by a method that minimizes and even neglects those things that are unique to their own species. The scientific method does not adequately gauge individualism, the nuances of human liberty, and the importance of the significant outlier, such as the distinguished statesman or the maniacal madman. By imposing a rigid and theoretically unquestioned dichotomy between fact and value, empiricists therefore fundamentally misunderstand human nature and, consequently, politics. For the last fifty years, little effort has been made to bridge these competing visions. It is unsurprising, therefore, that one of the most recent attempts to synthesize empiricism and political philosophy comes from a scholar outside of the academy. Erik Moberg, a Swedish free-lance political scientist, begins his work lamenting the fractured nature of the study of political science. Moberg believes that the discipline needs a drastic transformation. Criticizing both the behavioral emphasis of empiricists and the perceived unquestioned beliefs of political philosophers, Moberg argues that the study of politics ought to be grounded on a rigorous study of the State. His opening salvo claims, “Of all the institutions created by man, the state is the most important” (1). The State is so pivotal that he even suggests that political science needs to change its name to the science of states, as his book title suggests. In order to the study the State, Moberg utilizes two important theoretical ideas. The first theoretical instrument is the use of history. In the second and longest chapter of his book, Moberg provides a detailed history of human civilization, beginning in Mesopotamia and concluding with the development of representative democracy in the modern world. This chapter is illuminating, and serves as an important contribution to the discipline. Political scientists are often bad historians for a variety of reasons, though the most common factor is their general ignorance of the subject. Even international relations, arguably the most historically-minded subfield of political science, usually only uses empirical data sets that begin with the Peace of Westphalia. Moberg shows that a such a limited understanding of history is detrimental. By mapping the progression of the Chinese dynasties, the Mesopotamian city-states, and the Western republics, Moberg aims to show that there are certain historical patterns. His most important historical claim, for example, is that representative democracies are historical accidents unique to Europe. I refuse to endorse his position that political representation is accidental. Nevertheless, his other argument about the uniqueness of European society – especially in contrast to Asia, India, the precolonial Americas, and the Middle East – is certainly an argument that deserves attention and respect. The second notable aspect of Moberg’s book is his differentiation of various regimes. The regime was at the center of both the Classical thought of Plato, Aristotle, Cicero, and Aquinas and the modern thought of Hobbes, Locke, Montesquieu, and Madison. The manner in which regimes are categorized is significant in political science. Aristotle’s six-fold division of regimes into the good and the bad rule of the one, the few, and the many demonstrate the Stagirite’s emphasis that virtue affects the regime. Hobbes’ three-fold division of regimes into the rule of the one, the few, and the many minimizes, if not ignores entirely, the role of morality. Moberg, on the other hand, endorses neither Aristotle nor Hobbes. Instead, Moberg creates his own four-way categorization of regimes: dictatorships, oligarchies, direct democracies, and representative democracies. Moberg’s division of regimes centers on power distribution, though he eventually makes a normative judgment in favor of representative democracies. Still, Moberg’s division of regimes is disappointing for three reasons. First, his discussion of dictatorship is unimpressive. The biggest problem is his failure to recognize the possibility of a just monarchy. For Moberg, monarchy is inherently dictatorship. Thus, he fails to distinguish unjust rulers like France’s Louis XIV and England’s Henry VIII from good and decent men like France’s Louis IX and England’s Edward the Confessor. Second, his analysis of oligarchy also suffers from the ability to divorce oligarchy, the bad rule of the few, from aristocracy, the good rule of the few. Third, his overview of representative government is framed almost exclusively within power dialectics. Relying heavily on the work of Mancur Olson, Moberg argues that “a state is characterized by its monopoly of violence” (108). Such a materialistic framework, grounded in contestable theories of individual autonomy and the intrinsic coercive nature of governments, does not provide an accurate understanding of representative government. What Moberg fails to grasp is that representative government is in accordance with justice because it best reflects human nature. Its origin rests, not in feudalism, but in antiquity. It is found, for example, in Aristotle, who argues in the Politics that in a polis a citizen rules and is ruled in turn. Moberg ignores the Classical framework of representative government which teaches that human beings are rational animals who, through the guidance of an unchanging nature, can understand right and wrong and, therefore, participate in some form of self-government. Representative government does not derive from a selfish desire for pleasure or gain but from the rational inclination to participate in politics for the sake of the good. Moberg’s monograph is not an easy read. It is a self-published book. There are occasional grammatical errors, the font is monotonous, and some of the chapters are choppy. It is an imperfect and, at times, a frustrating book. Yet, it is thought-provoking, well-researched, and instructive. It reminds its readers of the importance of historical development and the general need to utilize historical research. It invites a reconsideration of the importance of regimes, as opposed to the study of base behaviorism. It also provides a blueprint of how empirical and philosophical political science can work together. The book would be a welcome addition to a university or high school library. Erik Moberg’s response to this review is available here. Thomas F.X. Varacalli is Lecturer of Political Science at Texas State University. He has published in the Naval War College Review and Logos: A Journal of Catholic Thought and Culture. Michael C. Desch’s Public Intellectuals in the Global Arena: Professors or Pundits?